Dress turns on easily - turn the internal battery pack on or off and click the light up button! Not all witches like dark scary things. Contrary to popular belief some witches like light magic. They like when things sparkle, and shimmer. When they shine, and glow. And those same witches stay away from spiders, and rats. And refuse to put curses on anyone. Your little girl is this kind of girl. She likes magic, but she would be more inclined to hang out with Glinda the Good Witch, than the Wicked Witch of the West, or East for that matter. She is the kind of girl who get's angry when she watches Disney movies that have the bad witch winning for a while. Like Tangled. She hated Mother Gothel. Hated her for how mean she was to Rapunzel. 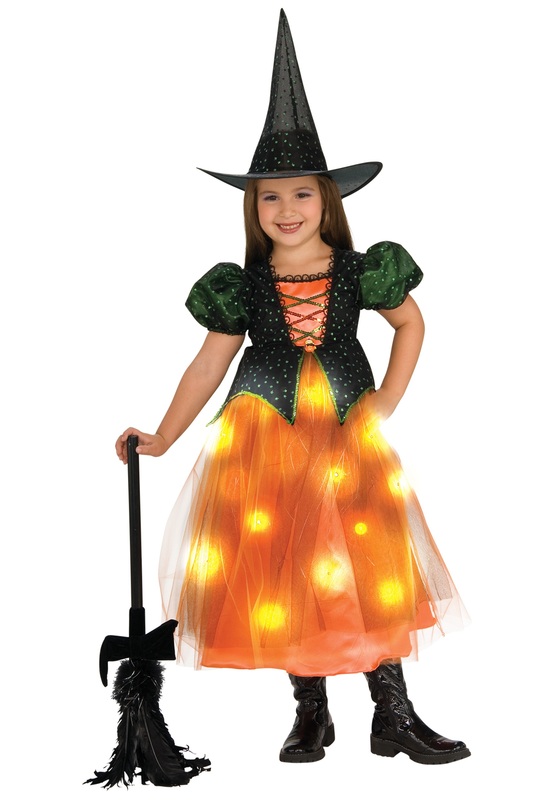 So this Halloween let her embrace her witchy side with this Twinkle Witch Costume. Everyone who sees her will know that she isn't an evil witch, no, she is a good witch. The best witch. Because she really doesn’t like injustice. And she hates curses, especially ones that hurt innocent princesses. And she really hates mean witches. After putting on this orange light up dress she just might feel powerful enough to stop all the bad witches in the world. She might want to sit them down, and have a long talk about why it is important to be nice to people. Or she might just want to go around the neighborhood trick or treating for candy.